The notion of a Lithuanian cemetery belonging exclusively to the people arose early in the life of the Chicago Lithuanians, although practical steps began only in 1910 to implement the idea. The Lithuanian Sons Society first took the initiative. About the same time, other non-church freethinker associations echoed the plan, including: Blessed Lithuania, Truth Lovers, Homeland Patriots Chapter 1, Lithuanian National Alliance Chapter 36, and a dozen other organizations. 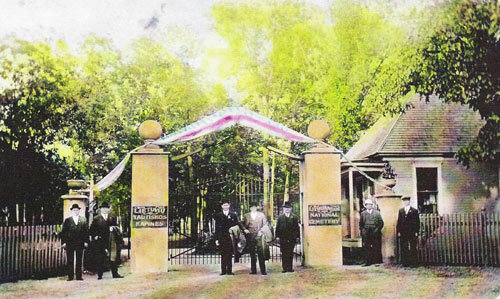 Memorial Day, May 30, 1912, saw 6000 people attend the opening of the Lithuanian National Cemetery. Delegates met on February 2, 1911, to discuss details of land purchase and the payment of dues. Soon, on March 28, 1911, eleven society representatives signed a state-authorized charter. With this document in hand, a seven-person Board of Trustees was formed on April 15, 1911. A search led to a purchase of a twenty-one acre tract of land in the Chicago suburb of Justice on January 1, 1912. Participating societies and individuals bought bonds to finance the mortgage. Backed by such widespread support, the cemetery became a reality on Memorial Day, May 30, 1912, in the presence of a throng estimated at 6,000 people. Ceremonies included banner-wielding societies, processing to music provided by the “Lietuva” band of K.J. Filipavicius. The Chicago mayor sent an aide to give a short speech, offering typical praise for such type of a community venture. F.P. Bradciulis and K. Jurgelionis delivered Lithuanian talks, and the choir of the Lithuanian Socialists chapter 81 sang a then-national song, “Lithuania, My Homeland”, by Vincas Kudirka (now known as the Lithuanian National Anthem). They also sang “La Marseeillaise” which for many years was considered not only the national anthem of France but also a revolutionary song, and an almost unimaginable thing happened for that time: this song was followed by the religious chant “Dievas – Musu Gelbetojas ir Tvirtybe” (God is Our Savior and our Strength).